In a recently published ITwiz BEST 100 report, distinguishing the largest IT companies in Poland, Atende Software has been listed in more than a dozen statements, including 5th position among the companies with the highest revenue from the media sector, reaching revenues of 21 463 k PLN. Achieving such a high position was possible thanks to the successful sale of the redGalaxy platform, which is currently used by such internet TVs as: player.pl, ipla.tv or playnow.pl. Revenues from this sector account for as much as 74% of total revenue. Atende Software took also 6th place among the companies with the highest revenue from sales of cloud computing services in Poland with the result of 17 234 k PLN. In addition, the company was in the top 10 among the companies with the highest sales of web applications and web portals (PLN 2082 thousand), 12th among companies with the highest sales of mobile applications and 17th among companies with the highest revenues from the electricity sector. It is noteworthy that Atende Software was ranked on the 24th position among the companies with the highest revenue from the sales of security solutions, although its activity in this area began only in 2015. The company offers redGuardian service to protect against DDoS type attacks and which based on proprietary software. Apator Metrix, leader on the European gas meter market, signed the license agreement with the Atende Software Group company Phoenix Systems. 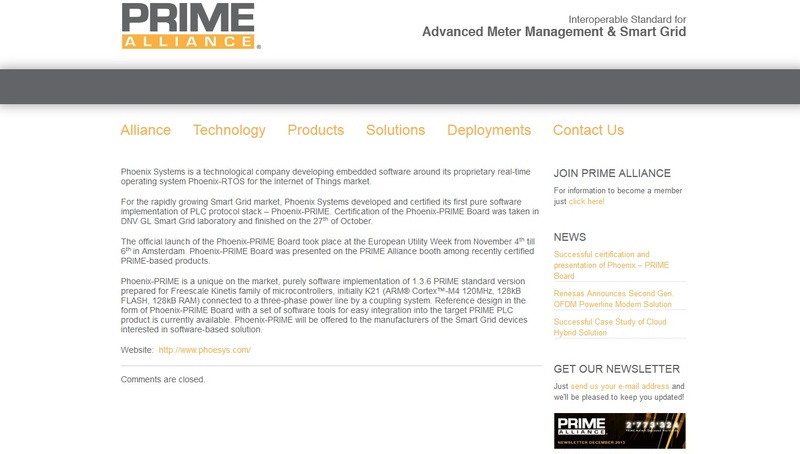 According to the contract, Phoenix-RTOS realtime operating system will constitute the basis for its next generation smart gas meters. Apator Metrix S.A. is one of the biggest gas meter vendors in Europe. Next generation smart gas meters will be dedicated for Western Europe markets, in the first place offered in Italy. Phoenix-RTOS operating system was selected as the basis for the smart gas meter software resulting in the rapid software development. The software was developed in the very similar way as in the case of traditional operating systems. However, the resulting code is very compact and the power consumption was substantially minimized resulting in 10-year lifetime on a single battery. The certification process has already started and will continue for the several next months. “The rapid development of the intelligent building and network markets results in involvement of the largest IT players in the adaptation of the communication technologies. The consequence may be shift in the R&D resources management priorities by the meter vendors. The traditional model, where the whole products design process was kept internally, is becoming ineffective. The network AMR/AMI technologies are heading quickly toward standardization and the main priority now is to shorten the product time-to-market. It can be achieved only by partial outsourcing of the R&D activities and focusing on fast system solutions implementation and customization. We are gradually migrating from meter vendor towards becoming a hardware vendor. The cooperation with Phoenix Systems concerning the Phoenix-RTOS operating system is of the strategic character and fully complies with our new R&D resources management strategy. We outsource external competences to minimize the product time-to-market, meet the specific market requirements and participate in the meter exchange program. At the same time the smart gas meter architecture must be flexible enough to allow for modifications required by other markets”, said Arkadiusz Chmielewski, Apator Metrix CEO. “Smart gas meters are just another example of the IoT devices successfully powered by Phoenix RTOS. Few are aware of their rich functionality and at the same time rigorous construction and power consumption requirements. It makes me proud that Phoenix-RTOS was selected as the basis for the smart gas meter software”, said Paweł Pisarczyk, Phoenix Systems CEO. Apator Metrix S.A. is part of the Apator Capital Group and one of the largest gas meter vendors in Europe. In 2016, Apator Metrix exported, mostly to Western Europe markets, 87% of its products, most of them being the smart gas meters. Phoenix Systems sp. z o. o. is a technology start-up, which developed and commercialized the real time operating system Phoenix-RTOS for the needs of the Internet of Things (IoT) market and in particular the Smart Utility market. We are very pleased to announce that Atende Software and Phoenix Systems have met the required criteria and will receive funding under the Intelligent Development Operating Program 2014-2020. Atende Software will receive a grant of PLN 5.4 million PLN for the creation of the besmart.energy platform for management of the energy clusters. 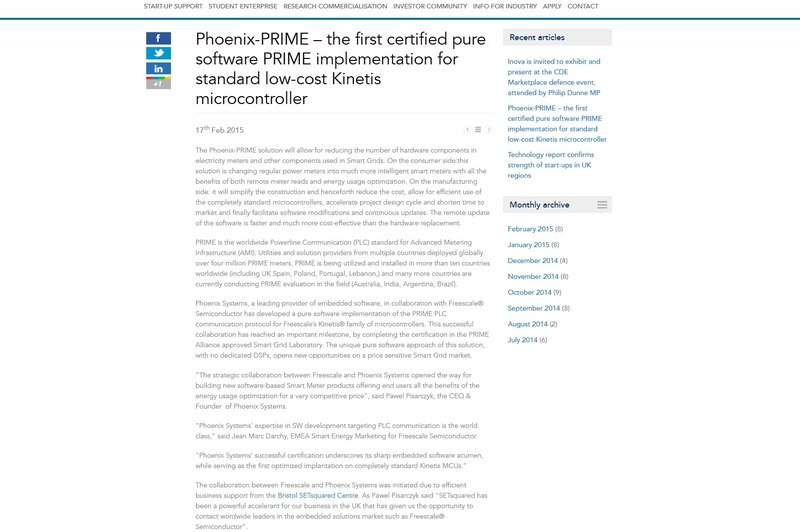 Phoenix Systems will receive a grant of PLN 2.1 million for the development of a real-time operating system with microarchitecture for software-defined IoT devices of low power consumption - Phoenx-RTOS 3.0. The leader in the Polish data center market has signed an agreement with Atende Software for deployment of the redGuardian system, which will protect the operator’s network infrastructure against volumetric attacks. The solution’s capacity is sufficient to neutralize high-intensity attacks, and thus represents a response to the growing number of ever more serious incidents threatening cybersecurity. The redGuardian system has been created and developed fully independently by Atende Software over a number of years. It protects against all types of volumetric (DDoS) attacks, making use of a constantly updated signature list to identify threats. It is distinguished by its ability to fend off attacks on a much larger scale than those generally recorded at present – of the order of hundreds of millions of packets per second at a single node. The agreement between Atman and Atende lasts for 24 months, with the option of automatic extension to subsequent 15-month periods. At present the system protects the dedicated server infrastructure at the Atman Data Center Warsaw-1, and thus protects all clients leasing servers from Atman. The operator is also beginning to offer its business clients the same type of protection for Internet connections, which means that every interface between the Atman client’s network infrastructure and the Internet, wherever in Poland it may be located, can be protected by redGuardian. The cost of the service does not depend on the size or number of attacks that occur – a subscription is paid for a guaranteed connection bandwidth for filtered traffic and for the time for which the service is used. –	“The number of attacks that block servers by submitting huge numbers of queries will continue to grow, as will their intensity and reach, enhanced by the use of IoT ecosystems. In October 2016 an attack of this type on Dyn’s servers paralyzed a significant part of the network infrastructure in the United States and parts of Europe. Cybercriminals will be using increasingly advanced attack methods, and ensuring that our clients’ data is adequately protected is a priority for us. For this reason we have decided to deploy a new, high-performance anti-DDoS solution. We have no doubts that the redGuardian system will come up to our expectations and those of our clients,” explains Sylwester Biernacki, Atman’s CEO. –	“The deployment of the system in the Atman network is a very important step in the development of the redGuardian product. We are pleased that Atman has opted for a solution developed in Poland. A key competitive advantage of our product is its very high capacity and scalability, which go significantly beyond the volumes of attacks so far recorded in Poland,” said Przemysław Frasunek, Multimedia & Security Department Director at Atende Software. One piece of evidence that DDoS attacks will become more common is the reported profitability of cybercriminal activity. While the least harmful such attacks can now be ordered on the black market for just $7, and those of higher intensity are valued at around $100, attacks aimed at well-secured sites that are harder to bring down may cost $400 or more. According to experts from Kaspersky Lab, the profit margin on DDoS attacks carried out to order may be as high as 95%. There is no shortage of examples confirming the growing frequency of DDoS attacks in Poland. Last year, for instance, North Korean cybercriminals were behind an attack launched against Polish financial institutions. Somewhat earlier, one of the largest Polish providers of cloud computing services suffered a cyberattack with an intensity of 24 million packets per second, bringing down sites hosted by that operator. Taking a broader view, according to a PwC survey on the state of Polish cybersecurity, as many as 96% of firms with at least 100 employees had experienced 50 or more attempted attacks in the past year. ATM S.A., operating under the Atman brand name, is a Warsaw Stock Exchange listed corporation which is the leader in the Polish data center market and expert in the secure transmission and processing of data. Atman provides colocation, hosting and cloud computing services at its own data centers, which contain total space of 13,600 square meters. Using its foreign connections and its fiber-optic networks in the largest cities in Poland, Atman offers broadband services, including Internet access and data transmission. Its main clients are telecommunications operators, traditional media and Web portals, as well as businesses in the financial sector, commerce and industry. For more information see www.atman.pl. OmniChip is a company from Atende Software group, that specializes in integrated circuit design and has many years of experience in NFC (Near Field Communication) technology, used in payment cards. Using its unique experience, the company has designed chip that protects against theft of money and data from credit cards, identification cards and access cards. The chip activates when an attempt to read data is made and generates sequence interfering with reading, blocking access to the card. This chip does not require battery power, because the energy needed to operate is extracted from the electromagnetic field produced by the card reader. The chip has successfully passed the production test and within two months a final card with the chip will be developed. Commercial debut of the product is planned in half of the year. "I am glad that we have designed the first, integrated circuit design that, what we think, will be of great interest to our customers. We are just entering the next phase of product launch. We are starting to look for a partner who will distribute our cards to those who would like to be sure that their card data and funds are always adequately secured” says Tomasz Pomorski, President of OmniChip. OmniChip is a company designing large-scale integrated circuits. The aim of the company is to design and develop microprocessor circuits that are used in monitoring, managing and optimizing the energy use. The company is one of the few entities on the Polish market working in the field of integrated circuit design. Atende Software has signed an agreement with the KSW Federation for a full service of providing KSW events on the Internet. The scope of the contract includes, development and maintainance of the kswtv.com portal, video content transmission, and share it with the CDN. Kswtv.com portal allows to purchase access to the event in PPV (pay per view) model and watch the HD stream, with timeshift support. Archival material will be available for 72 hours after the end of the gala. The contract was concluded for a period of 12 months, with the possibility of its further extension. The nearest KSW38 gala will take place on April 7, 2017 at 19:00. EuroPOWER, one of the most important events of the power sector in Poland, has just started today. The conference from its beginning was a response to the needs and challenges posed to the Polish power industry market. In this year's jubilee, the 25th edition, rises the topics of the most important changes taking place at the moment in the industry and challenges that arise to the Polish energy sector. Paweł Pisarczyk, CEO of Atende Software and a President of Smart Grid KIGEiT Section will discuss the challenges that the company faces each day in a panel devoted to technologies in the Polish power industry, during the second day of the conference. As we read on the conference's web page: EuroPower has become an extremely effective platform for dialogue, and above all, the place for public consultations with government representatives and industry representatives.